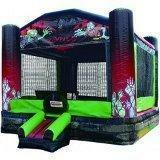 Watch out for the undead with this Zombie Bounce House!!!!! It comes in dark, eerie colors to help set the mood of your celebration and features a creepy zombie crawling scene above the entrance. Hold on to your brains because little walkers everywhere will be clawing to get into this jumper!!!!!! !